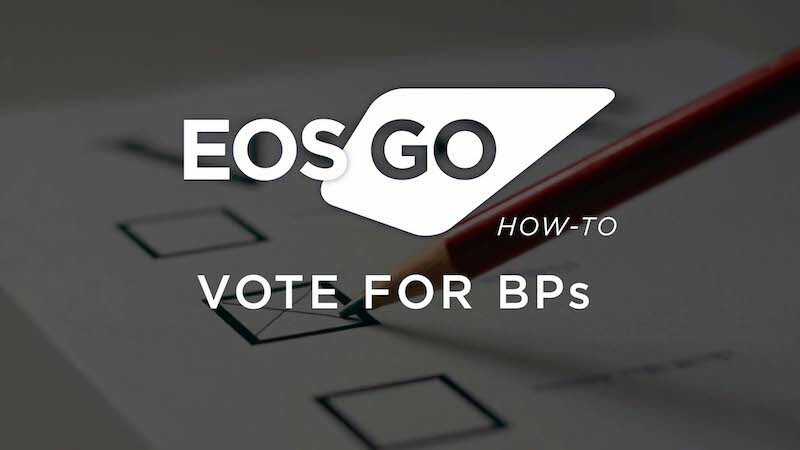 Welcome to the EOS BEGINNERS article on how to vote for a block producer. 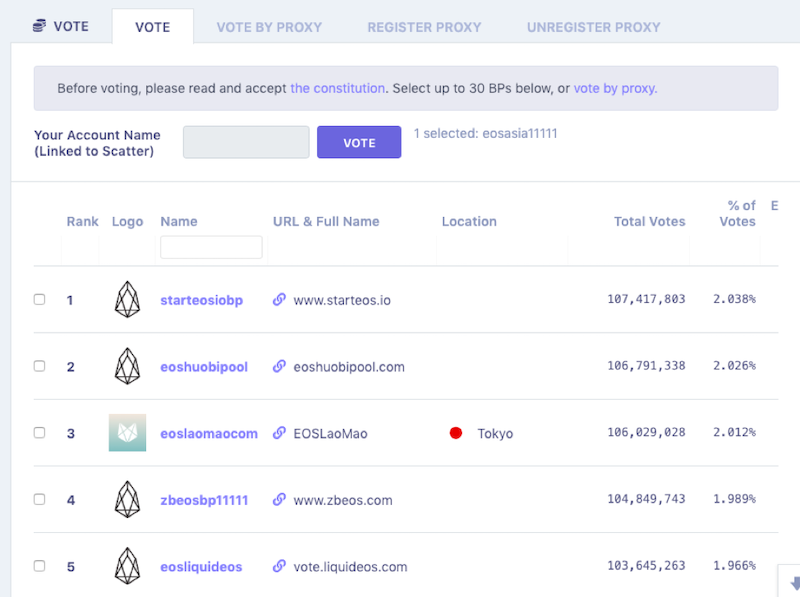 We will be guiding you on how to vote for a block producerl using our tool, EOSX.io. EOSX.io is a web wallet, block explorer, and account manager all-in-one. Block producers run the servers that run the EOSIO software. They are the community’s database. Since they all run the software, they all have duplicate information saved on their servers that they compare to one another’s to make sure the information has not been tampered with. Why are there 21 main block producers on the EOS mainnet? There are 21 main block producers on the EOS mainnet so that consensus can be reached more quickly than if there were 151 producers or 1000 producers. These 21 are “double checked” by standby BPs that also run the software, to help keep the top 21 honest. If one or several of the top 21 stop producing, stand by BPs take their place. Block producers do more than produce blocks; they are also in charge of implementing systematic changes to the software. You should vote for block producers that represent your values so that they make decisions that make the chain and software more valuable. If you do not vote, you are leaving others to make the decisions on block producers, and those voters may not share your values. NOTE: IF YOU DO NOT WANT TO DO THE RESEARCH TO VOTE FOR 30 BLOCK PRODUCERS YOU CAN RESEARCH A PROXY THAT WILL VOTE ON YOUR BEHALF. THIS IS AVAILABLE THROUGH THE SYSTEM. Once you download Scatter and import your keys, navigate to EOSX.io. Go to the Wallet drop down in the top right hand corner and select the vote and proxy option. 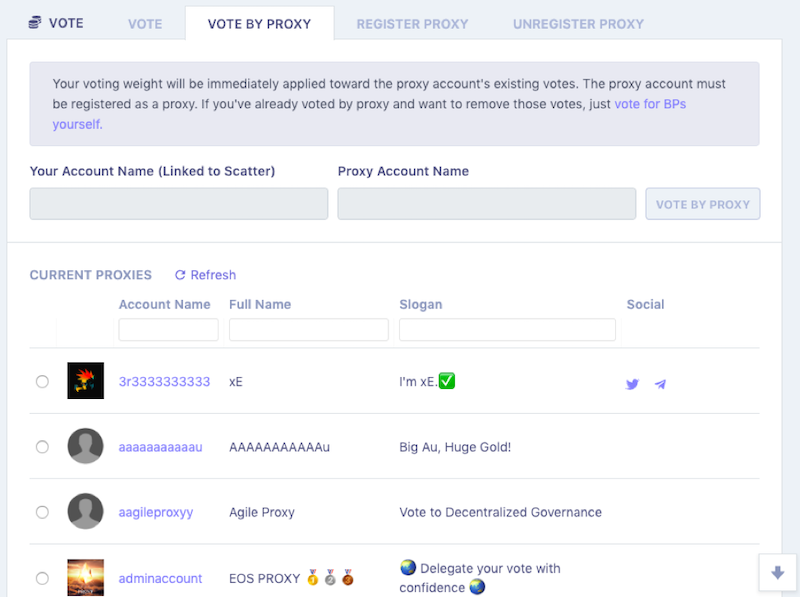 Once you navigate to the vote and proxy page, EOSX will prompt you to connect to Scatter to vote. It will say Attach Scatter Identity; select the identity you want to use to vote. Once EOSX is connected to your Scatter you can vote. A list of block producer candidates will be listed click on the 30 block producers you want to vote for. You can vote for fewer than 30, but most people suggest to vote for all 30 to best secure the network and spread out block producer rewards. 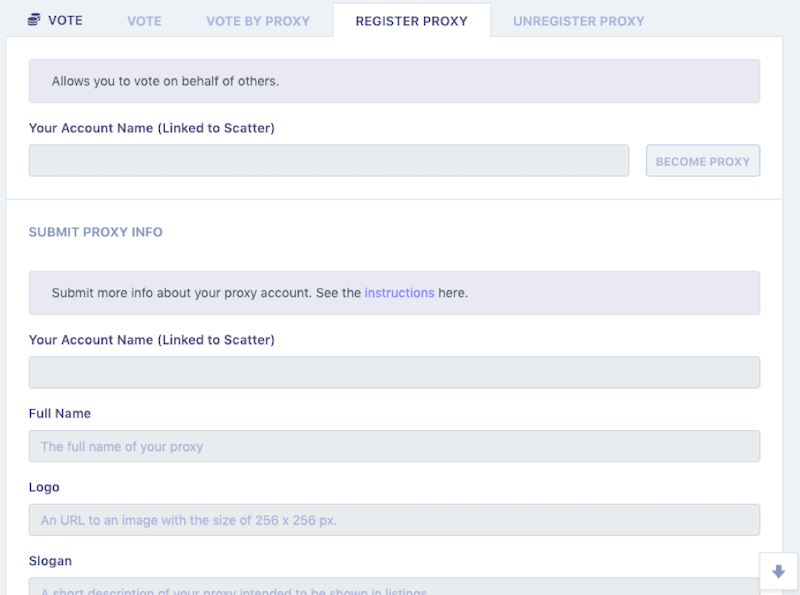 If you do not want to research 30 block producers to vote for you can select a proxy to vote for you. Proxies select block producers they vote for, and when you delegate your vote to them, they get to use the weight of your tokens to vote for the block producers that they think are best. You can also choose to become a proxy! If you want to register as a proxy select the register proxy tab and follow the prompts to become a proxy for the network. If you want to check to ensure that your vote went through, you can navigate to your account using EOSX and check your recent voting transactions. 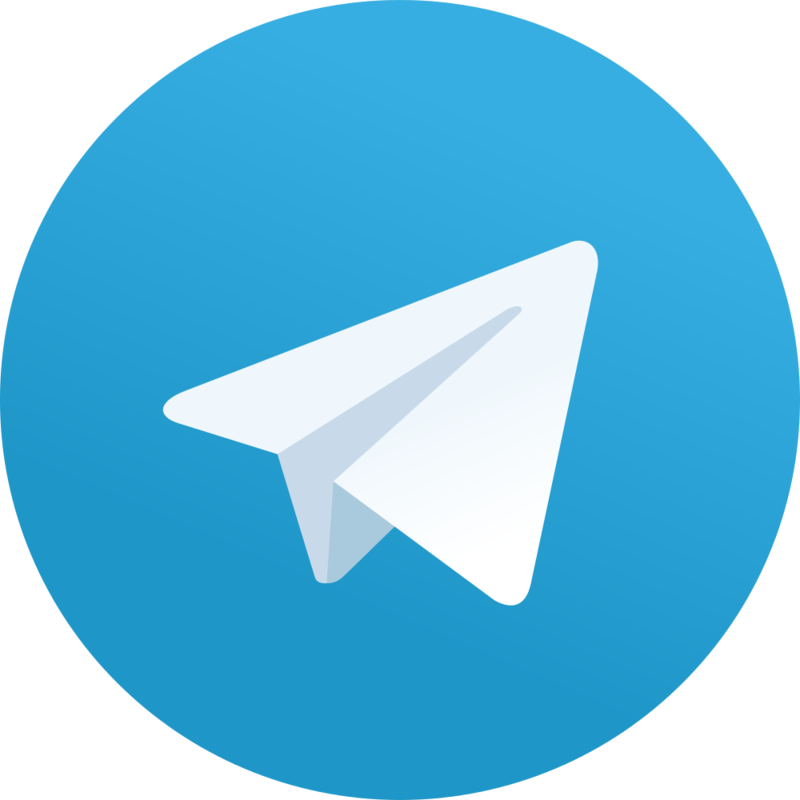 If you have any questions about voting for block producers, or EOS in general, please join us in our Telegram group https://t.me/eosgo.